McCoy Water Supply Corporation offers a wide variety of convenient payment options for our customers. Simply choose the option that best suits your needs. To view an example of what your Account Portal Page looks like, please scroll down to the bottom of this page. 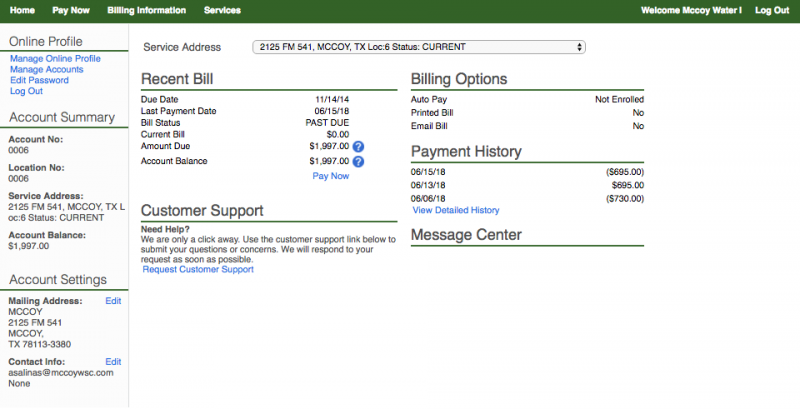 Paying your bill has never been easier now that HEB and Wal-Mart accept McCoy Water Supply Corporation bill payments! Just visit any HEB or WalMart Business Center. http://www.checkfreepay.com/agentlocator Select the SEARCH BY ZIP CODE purple link under the Note Section to direct you to search by your zip code. When making a payment at an HEB or Walmart outside of the McCoy WSC area, you may need to ask the clerk to check for McCoy Water Supply Corporation in the CheckFreePay system. Our local HEB and Walmart locations are familiar with McCoy WSC but other locations outside of our service area may need to check the system. Please continue to reporty your monthly meter readings using our website or by calling, faxing, or mailing your meter reading to our office. Meter readings cannot be entered through the CheckFreePay system when paying at HEB or Walmart. The CheckFreePay new payment option offers our customers greater flexibility; we hope that our customers will continue to alert us to any difficulties so that we can resolve them. You may pay your bill in person at our office address. We accept cash, check, money orders, or credit cards. To avoid longer wait times, please note that Mondays, Fridays and the first day after a holiday are normally very busy. We have a night drop box located near our entrance gate at our office address. We accept check or money orders. Payments are posted the following business day. McCoy WSC willl now accept payments at our new drop box payment location inside the UPS Store in Pleasanton. You may conveniently drop off your payment during UPS store business hours.